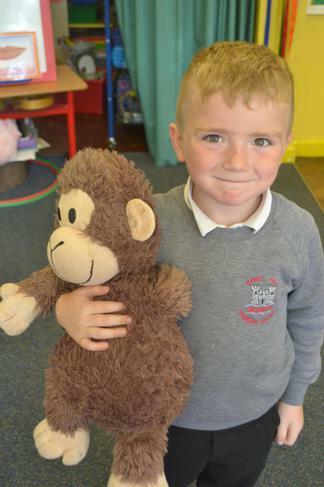 Each FRIDAY our class pet MIKE chooses someone in the class who he wants to go home with for the Weekend! MIKE watches EVERYTHING that goes on throughout the week. We love to hear who he wants to go home with each FRIDAY! Mia had a great Weekend with MIKE. She took him to the hairdressers and to Pizzarellies for some delicious food. He also had a little trip to Football Club with Mia. THANK YOU Mia for taking such great care of Mike. Mike had a GREAT Weekend with Connie! Thank you Connie for taking care of Mike over the weekend. He is back with a BIG SMILE and said he had so much fun at your house. You had a very busy weekend! Corey took great care of Mike. He had a sleepover with Mike at his Nanny's house. Corey told us that he even made a special bed for Mike to sleep in! Thank you Corey for making this a great weekend for Mike - we hope you had as much fun as he did! Mike had a great time spending the Weekend with Reece. He played lots of games and even had a trip to Sunday School with Reece. Mike wasn't feeling too well over the weekend and didn't want anything to eat! - Poor Mike. Thank you for taking great care of Mike when he wasn't feeling well. Thankfully Mike is feeling fine again and is looking forward to spending next Weekend with some lucky boy or girl. Mike had GREAT FUN with Thomas! Mike had a busy weekend with Thomas! Mike was a great help as Thomas was moving house! Thomas told us Mike helped him move furniture and also got himself a little dirty as he was SO busy doing lots of jobs to help woth the big move! Mike was SO tired he didn't make it back to school on Monday Morning.....thankfully he returned on Tuesday! Mike had a FUN weekend with Madeline! Mike had fun with Madeline. He learnt some new tricks when playing MINDCRAFT on the Computer! He also had lots of fun chilling watching the TV with lots of yummy treats! Thank you Madeline for taking care of Mike over the weekend. Mike had a lovely Weekend with Rosie and her family. He went to visit her Granny - but was not allowed to eat too many sweets! Rosie allowed Mike to play with her toys at home. It was very kind of you Rosie to share your toys with Mike. Rosie also went to visit Santa but it was too far away for Mike to go with her - he just stayed at home and chilled watching TV! Thanks for taking care of Mike Rosie! Thomas took GREAT care of Mike over the Weekend. He enjoyed himself that much he didn't want to come back to school! Mike had an adventure to the Hairdressers with Thomas - but Thomas said that Mike didn't need his hair cut this time! He had a great hanging out with Thomas at his house - he told us that Thomas has a really really comfy bed! 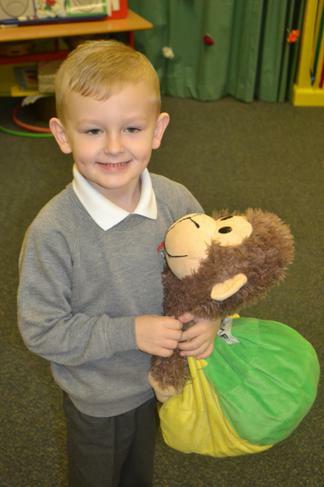 Well done Thomas for working so hard during the week - keep up the good work! Mike had an AMAZING time with Oliver. He had a magical trip to see SANTA. 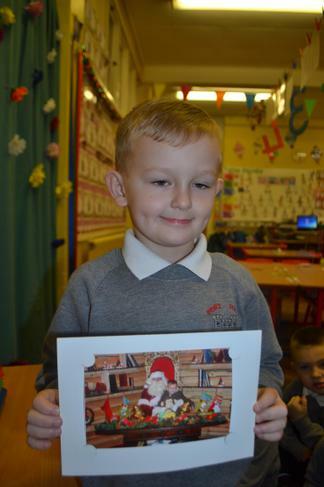 He even got his Photograph taken with the big man himself! Oliver has been making SUPER choices in class and is working really hard. Mike watches everything that goes on in P1. Thank you Oliver (and family) for making Mike's weekend so enjoyable. Mike has a GREAT time with Caleb! Mike had a GREAT weekend with Caleb. 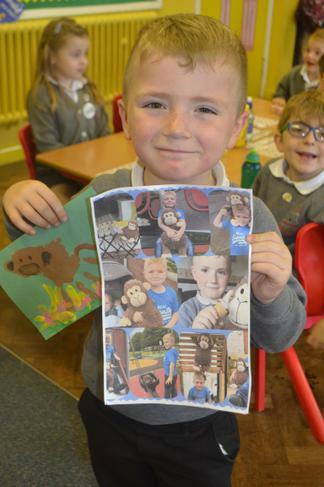 He had a sleepover at Caleb's Nannys and even got to sleep in a lovely cosy bed with an electric blanket - Lucky Mike! He had great fun playing Dinosaur Snap and watched some TV. Mike also went along to swimming lessons with Caleb - luckily Mike didnt decide to jump in! Thanks Caleb for looking after Mike so well. Ethan had a FAB Weekend with Mike! Ethan worked so hard during the week that MIKE decided he wanted to spend the weekend with him! Mike had great fun playing with Ethan and even went for a wee trip to the shop to buy a teddy. Ethan enjoyed letting Mike stay in his bed with him - Ethan said he was very cuddly! Thank you Ethan for taking great care of Mike. Mike had a VERY BUSY Easter with Abigail! Wow! What a beautiful weekend Taylor had with Mike - the sun shone the whole time! You had a great time out in your garden with Mike - and had lots of fun splashing around in your pool. Mike really loved your minibeast hunt, although he is a little scared of all those spiders you found! Thank you for making this weekend so special for Mike. Keep making those good choices, we are SO proud of you Taylor. Mike had a super weekend with Guy. Guy's dad and big brother were away on holiday, so Mike kept Guy in great company over the weekend - Guy sure didn't get too lonely! Mike was very busy: He had a great time at Lillie's Birthday Party and also had time to go to the Cinema - I hope Mike didn't eat all of your popcorn Guy! You have been waiting patiently for Mike to choose you to take him home for the weekend - Thank you for taking great care of Mike and we know you had LOTS of fun together. Ala has been waiting very patiently ALL year for Mike to choose to spend the weekend with her. He had a great time and Ala loved carrying Mike around in her shoulders! We are glad Mike is not afraid of heights! Thanks for taking great care of Mike Ala.